Solarino Sand Beach Cleaner Robot is a particular combination between our powerful tracked mobile robot XBOT and one of its working units; it is the first ecofriendly, remote-controlled beach cleaning machine able to move both on wet and dry sandy terrain and to remove rubbish and other foreign matter. Totally electrically driven, powered by full isolated GEL batteries and also by solar energy, silent, accurate and robust, Solarino Beach Cleaner provides a comfortable and a low environmental solution for beach cleaning. It is robust since frame and tracks undercarriage are not only protected by paint, but also fully hot-dip-galvanized using both stainless steel and aluminium; the wide matched tread helps to optimizing the traction system performance both on wet and dry sandy terrains by providing a good flotation in any situation. The vibrating mechanical sifter is silent, robust and precise and its working parameters are totally configurable by using the remote transmitter. You can safely and easily tow heavy loads on the beach like boats and catamarans. Remove all the seaweeds by using the powerful back rake. Its high-quality tracks offer an excellent grip also on wet sandy terrains! 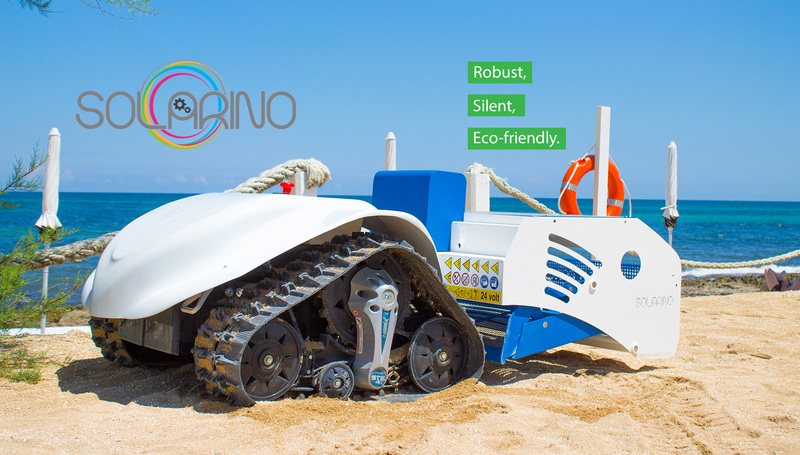 Solarino Beach Cleaner Robot is a robust tracked beach cleaning machine based on two electric motors and powered by fully-isolated AGM batteries and a solar panel. Its undercarriage is based on high-quality 100% natural rubber tracks able to offer an excellent grip action even on wet sandy surfaces. The mechatronics vibro sand sifter is powered by a powerful DC motor and its working depth can be controlled by the radio transmitter. You can easily drive Solarino with an incredible precision also at long distance up to 150 meters (500 ft). You can use the sand sifter for the beach cleaning, the rake for the seaweeds and the tow hook to move heavy loads on the beach. Electric Sand Rake with mechatronics features! Solarino Sand Beach Cleaner Robot is a complete solution for all your needs: it comes with an useful electric sand rake which allows the robot to pick up all algaes, seaweeds and rubbish which are usually present on the foreshore. You can easily disconnect the rear sand sifter and connect the sand rake in few minutes and with no efforts! To speed-up collecting procedures, rake is powered by mechatronics features so you can move it on the left and on the right during normal raking operations by simply using your RC transmitter! Watch the technical video tutorial to find out how much easier it is to clean a beach by using Solarino Beach Cleaner Robot! With lots of beach cleaning machines you always have to stop and manually change the working depth parameter every time the slope angle of terrain changes. This happens because when a generic cleaning machine climbs, the mechanical sifter sinks in the sandy terrain and for this reason the operator has to manually decrease the working depth value; the same thing happens when the machine climbs down because, in this situation, the operator has to increase the working depth value. With Solarino Beach Cleaner Robot, you can easily overcome this problem by using the radio transmitter to automatically and remotely set the correct working depth value without any effort. Solarino Beach Cleaner robot is not only a beach cleaner machine, but also a real robust and electric truck with the power of a tractor and you can choose to use it for a large variety of applications. Solarino is based on XBOT robot which has been carefully designed and developed following a particular modular structure to achieve multiple applications: for example, it is even possible to use the rear power joint to connect a rear trailer to carry heavy loads up to 1000+ Kg, small boats or even a big truck as you can see in the video! With a really affordable high-torque drivetrain, Solarino is designed to provide the best performace in any situation. 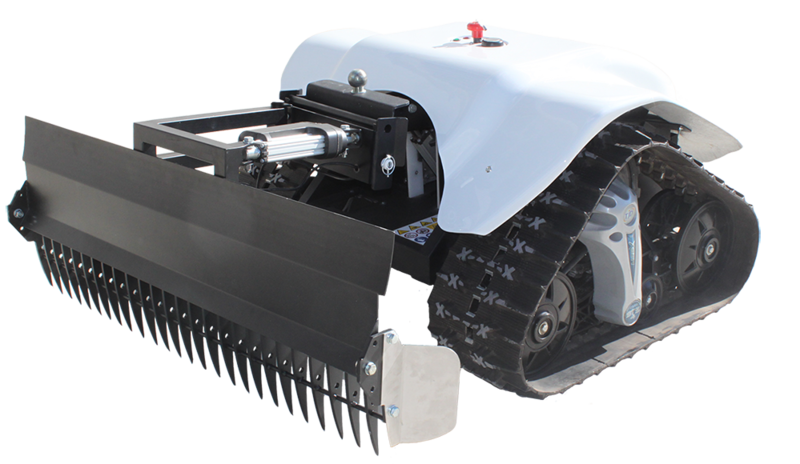 Solarino Beach Cleaner Robot can operate with precision in wet and dry sandy terrains, snow and mud without problems by minimizing slips. Flexible tracks trades 317 mm wide enabling the robot to tackle various obstacles such as rocks, roots, fallen debris, creek and climbs. The easy track tension adjusting system helps user to set the best configuration for each type of terrain without any effort. 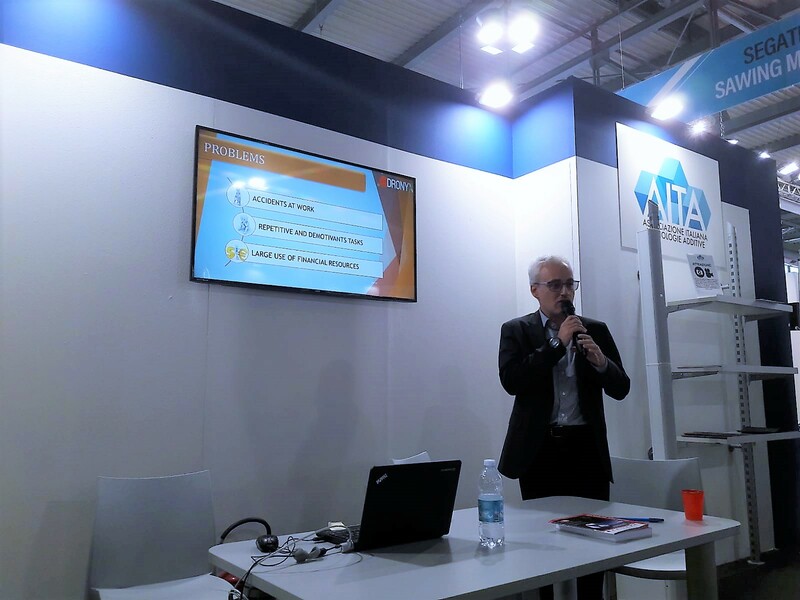 Solarino Beach Cleaner Robot is spreading all over the world! Contact us to check if someone in your area already has it in order to directly test it! If not, we can arrange a test in any case, you just have to contact us by using our contact form. 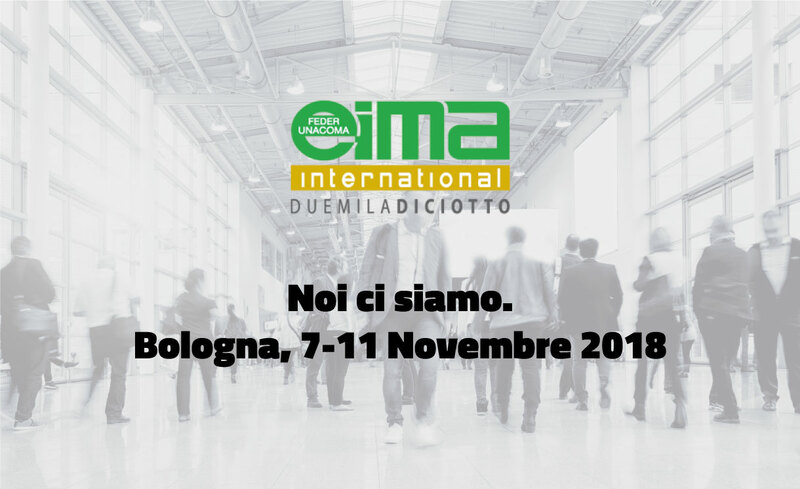 In the meanwhile, you can watch both on the net and on our webiste all the videos about the sand cleaner application to find out how much easy it is to control it. You can use the rear rake to clean all the beach games courts or even to level the sand after each match! Our clients successfully used Solarino to level the sand during the 2015 edition of the Mediterrean Beach Games in Pescara! The rake is also useful when you need to move heaps of sand or seaweeds form the foreshore.